Why do musicians need a Classical Revolution or CutTime? Why change anything? As classical musicians we are rewarded many times over with a life in music. Even to practice alone in a room is to experience great emotional powers. As unionized professionals we are rewarded even more with negotiated wages and conditions, by playing some music we deeply love and to discover yet more. Although some will try to take unfair advantage of us, where we do our best work, we are usually appreciated with a fair contract, loyal audiences and opportunities to work our way toward the artistic perfection for which we trained. For better or worse however, the duality of human nature tends to divide Americans into battles over culture. 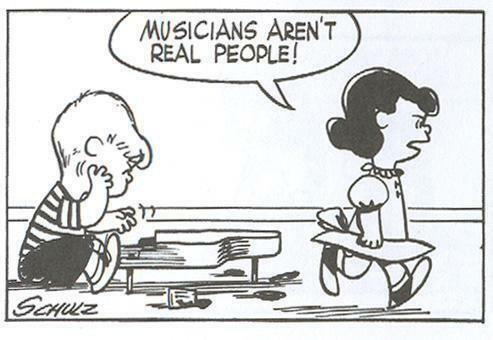 Dedication only goes so far when we musicians cannot bridge such a huge social disconnect from 78% of Americans. This is only made worse when we can’t articulate the benefits of classical to family and friends beyond words like great, amazing and incredible. Performing for loyal, knowledgeable, well-heeled audiences may be as good as it gets— but what about everyone else? The thoughts that those outside our core audience refuse to relate at all to classical, or that it’s just too hard and not my job to educate everyone, prevent us from even trying to find the words or key information that might clue in anyone to the benefits. These challenges are well documented. Conversely, we may feel like it’s bragging to extol those benefits, if we could list them. So we keep our mouths shut, stick to our arts-friendly community and imagine it doesn’t matter. We clearly are not in the habit of selling newcomers on our concerts, much less practically preparing anyone for the experience. In fact, when people say polite things, put us on a pedestal or say nothing at all in response to classical, then we usually choose not to push it. That might seem like inviting someone to church or like we’re selling snake oil. Because we truly love this music and our family and friends, CutTime proposes that these are exactly the golden opportunities to bring everyone together. 21st-Century musicians must not only be compelling artists, we must also become compelling salespersons for music— enthusiastically sharing with the curious the personal details that make us excited. If we’re going to fight against anything, let it be against the status quo of our own isolation. If we’re going to fight for anything, let it be for all of the humanity we can open to this music. Don’t let Lucy walk away! Engage her own creativity to get real with her about ours. We can eliminate our excuses to working past objections, which any good salesperson must do. In this way, we become better artists, using effective analogies and finding activities that bring people into the center of our music. We are really in the inspiration business through music. That means doing more than just playing well and musically. We make sure our music truly matters in ways people respond to: always exaggerate, always phrase the music; always talk to, always surprise, always open up to the audience. All music is essentially a spiritual experience. Our concert halls are where we worship the classical spirit. And much like a church, we musicians are the authorized celebrants; we are the priests offering meditation, reflection, transcendence and redemption. Today we must step outside our sanctuaries on a mission to spread this spirit to the whole city. Classical too can belong to anyone with an open mind and a few key insights, without giving up other music we love. This church analogy goes deeper. Like any worship service, the rituals of concerts are preserved with authority, authenticity and purity. The celebrants (in orchestras) wear unique ceremonial attire. The believers at our services are well-mannered, well-dressed and observant. The largely wordless music is internalized in a spirit of meditation and interpreted individually. Classicism today is largely centered in Vienna. Yet this city is so remote from American experience and so arrogantly exclusive— such a center will not soon accept glasnost. Yet that doesn’t mean we can’t make services that are open. Truly putting ourselves in the seats of any newcomers, we will understand how they might feel they are missing key information and hence feel unwelcome. As classicists we trained to maximize the adventures of musical ideas with silence. Because we learned to keep those ideas pure, uncompromising, even sanitized, we believe that modifying or adapting the original written recording will destroy the experience of the ideal, which the composer has so carefully set up. This perfection, we were taught, is fragile. Yet today we accept that classical is but one way among many to worship human spirit. In our imperfect, polyglot society, classical is not the dominant music, if it ever was. For various reasons fine art music has lost so much ground that we must now introduce it to whole generations, and demonstrate how we as individuals connect with its power. If before we would assume a listener knew classical, today we cannot assume listeners are knowledgeable. To this extent we have to start over with classical— and that can be seen as a huge opportunity to reset its context for the masses— in the present and where they are. The perfection of classical music is not fragile, because it never existed. The perfection of composition, like performance, is only an idealization. Both are living, breathing forms— even flawed and warrant adjustment. They are fully adaptable for a wider humanity. Before an open audience, or in an intimate setting, instrumental music can just about speak for itself. Using analogies and personal insights, we can open new listeners and connect with what they already love to justify the concert hall experience. As a form of entertainment in popular culture, as it faces a creative lull, we can reframe classical as a meaningful alternative. This is our chance to leave academia behind and move forward. Great musicianship goes beyond playing the notes. Let us likewise go beyond dumbing down to create real access points— to build new audiences for our traditional concerts, as well as build a new tradition. Join CutTime to learn how to step outside the sanctuary spreading good news. Read the Purpose page for more perspective-shifting. Read the Classical Music Consumers Segmentation Study of 2002 for the research. Invite Mr. CutTime to launch a Classical Revolution chapter in your community. Recommend CutTime to program week-long residencies with your orchestra, music school or local presenter. Residencies share CutTime engagement methods with your musicians in schools, churches, restaurants, clubs and concert halls. Purchase sheet music directly from our catalog.